For those of you who love trivia – Two great things took place in Jamestown back in 1886. 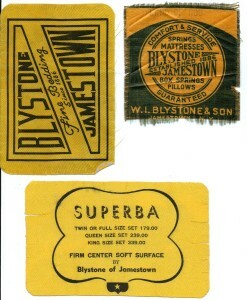 The village of Jamestown was incorporated in to a city and the W. I. Blystone Mattress Company started making mattresses and box springs in Jamestown. Fast forward 95 years and in 1981 the Pullan family purchased the bedding company and renamed it Jamestown Mattress. In 1981 Jamestown Mattress started with 3 employees, made 5 lines of bedding and had a small mattress showroom at the plant. Fast forward 32 years and today Jamestown Mattress is one of the largest independent bedding manufacturer’s in the northeast. Jamestown Mattress has 38 employees, makes over 40 different lines of bedding and has 9 stores across northwestern Pennsylvania and western New York. Jamestown Mattress also manufactures a 100% Natural/Organic line of mattresses that are sold all across the United States through four internet companies. Jamestown Mattress also has a large wholesale business: private labeling mattresses and box springs for other bedding retailers, college dormitory mattresses, hotel/motel market, group homes and quilting mattress kits for other small independent bedding manufacturers. Owner Jim Pullan Sr. his sons Jim, Steve, Bruce and his daughter-in-laws Pam and Lori along with his grandson Aaron are very active in the day to day running of the business. The Pullan’s take great pride and consider it a privilege carrying forward a company that has a combined 127 years of serving this community.